I just wanted to firstly say a quick thank you to everyone who answered my little Q&A - it was great getting to know you all a little better and if anyone still wants to fill it out I'd love to hear from you. :) But onto the purpose of this post, are you surprised that all the shades I'm going to talk about are variations of red? Because you shouldn't be. 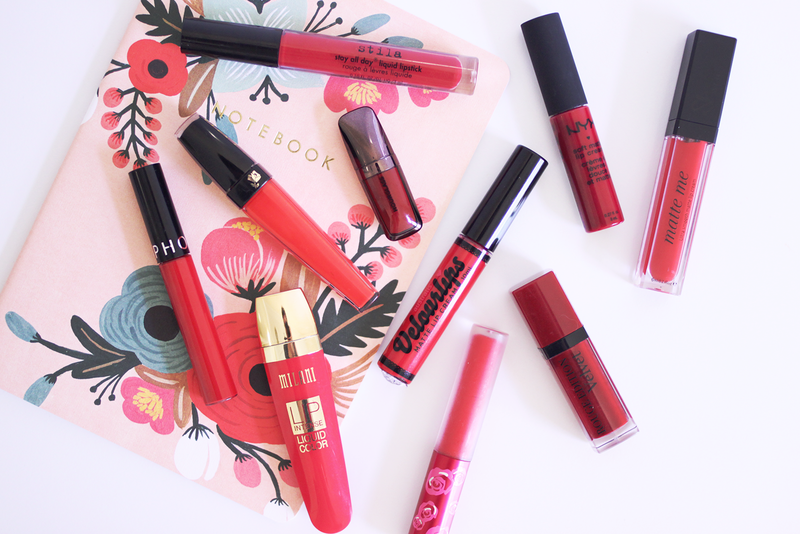 As a lip product addict/hoarder/aficionado I thought I'd do a round up of the long-wearing, matte liquid lipstick type products that I have in my stash so you don't have to try out as many varieties as I have (unless you want to of course.) I've got you covered across every price point and with so many options to choose from, I feel like I have pretty high standards. A few things to note are that I haven't touched on wear time because I've found it to be pretty consistent - they all wear just fine until I eat or drink something and then they'll wear away slightly on the inside of my lips. Not completely away like a lipstick, and they definitely don't leave an awful ring around the outside of your lips, but they will wear away enough to warrant a small touch up, which I expect to do because as if I ever go more than a few hours without eating or drinking something. Also, I expect matte lip products of any variety to be drying, so while I haven't done this when testing these products, for regular wear I like to dab a bit of my boo Reve de Miel on top which doesn't sacrifice the matte finish but it does help avoid dryness and it eliminates stickiness and any other undesirable qualities of a product's finish. I'd definitely suggest doing that with any of these and with any matte lip product you have if dryness is an issue for you. Let's go alphabetically. Application: feels like quite a thick, dry-ish sort of cream going on, but very pigmented. Finish: a little sticky when drying down, and overall one of the more drying products of the lot but very matte and opaque. Application: applies sheer, which can be a plus for some, but you definitely have to layer the product to get an opaque shade. Finish: feels very smooth and creamy on the lips, living up to its velvet name, it's non-drying and extremely comfortable. The best way I can describe the consistency is like a stain suspended in a gel. However, it takes a long time to become matte, and the colour definitely transfers and really isn't true to the shade in the tube and it's nowhere near as pigmented as I'd hoped. Layering: layers just fine, which it has to, really as it takes a couple of layers to get it opaque on the lips. Application: because these aren't completely opaque the product applies a bit streaky at first and you do have to work with it to get even colour across your lips. Also rather than being a standard doe-foot applicator this has a flexible sponge tip which may be a plus for some but I find it difficult to get an even line around the lips, making lip liner an essential. Finish: it takes a while to dry down and in that time things get pretty sticky, which means the product can transfer a bit. But when it sets it has the appearance of a beautiful deep stain on the lips with a slight sheen, feels totally weightless and it's one of the least drying of the bunch. Layering: this doesn't layer particularly well, the product tends to build up and look uneven and feel uncomfortable. When you have to touch up I'd advise removing as much as you can and starting over. Smell: vaguely chemically and powdery. Overall: Hourglass have some seriously beautiful shades in this range but I have to work with the product more than I think I should have to at that price point. It's worth having this one but I probably wouldn't buy another. 6.5/10. Application: smooth and easy to apply, but it requires 1-2 coats to become opaque. It also has a pointed sponge-tip applicator which makes it easy to get a defined cupids bow. Finish: very similar to the Bourjois Rouge Edition Velvets, this is creamy, non-sticky and comfortable, but it's also not really matte. While it's certainly more pigmented and true to colour than the Bourjois version you'll still need to build it up a little and the result is a beautiful, albeit somewhat glossy finish. Unfortunately it's also prone to transferring. Smell: slight powdery "old lady" smell. Application: smooth and completely opaque. Finish: dries very quickly, with some stickiness but no transferring. Very full colour, however it does deepen slightly over time which can be noticeable when reapplying a few hours later. Smell: pleasant vanilla powdery scent. Application: fully pigmented and easy to apply. Finish: not actually matte, but it's very comfortable to wear and feels like a super thin gloss on the lips that's totally opaque and non-sticky. It also doesn't dry down or set but it's not the least bit drying on the lips and it leaves behind a decent stain. Overall: it's not overly matte but it's fully pigmented and very comfortable, but unfortunately the shade range leaves a lot to be desired. There's only four shades and it's not available worldwide so I can only give it a 7/10. Application: it feels a bit moussey in texture so it applies very smoothly with a standard doe-foot applicator. Finish: I like that the word soft is in the product name because these actually do feel soft on the lips, but they're still super matte. It's a little bit sticky as it dries down, but it doesn't transfer and it feels weightless on the lips, however I've found the colour it dries to is slightly different from what's in the tube. Application: smooth and totally opaque in one coat. Finish: it's the tiniest bit sticky as it dries down, but it does so very quickly and becomes completely matte and very comfortable to wear. It also doesn't transfer once dry. Layering: no problems with layering. Application: a full pigment liquid lipstick that applies smoothly and evenly. Finish: this feels like nothing on the lips until you press them together and feel the intense stickiness, which is surprising because once dry it has a completely matte, paint-like appearance. It doesn't feel sticky on other surfaces (fingers, mugs) and it doesn't transfer at all, so if you can avoid pressing your lips together then it's a pretty great product. However, it's worth noting that the shade deepens slightly as it dries so you will lose some of the brightness you see in the tube. Layering: this layers perfectly evenly without any discomfort, although it'll deepen the shade ever so slightly again. Application: full, opaque colour, totally smooth and creamy with a slighly moussey texture. It also has a flexible sponge tip applicator which isn't my favourite as it makes lip liner necessary. Finish: like the Sephora offering this is a tiny bit sticky as it dries, but it's very comfortable and matte and doesn't transfer. Hey, I'm Jessica, a 27 year old from Sydney who loves Nick Cave, the Beat Generation, travelling, vintage, makeup & skincare, theoretical physics, collecting vinyl, analogue cameras & eating dessert for every meal. Copyright © Jessica Bialkowski 2015. Powered by Blogger.